Resound.com has an excellent page on how hearing loss affects your friends and family. You can find it here. There is a link within the Friends and Family page to another page discussing smart hearing. More and more people are telling me how impressed they are with the new technologies that link their hearing aids to their electronics, such as smart phones and smart watches. As I previously discussed here, smart apps, Multi Mics and TV streamers can further enhances the advantages of adding hearing aids to your life. Hearing aids are much smarter than they used to be. Smart technology can allow the aids to change between pre-programmed settings on their own, adapting to the situation at hand. Some clients choose upgrades just because they want their hearing aid experience to be completely hands free. Check out the page at Resound.com. Please give me a call with questions. I currently use some of the smart technology in my personal life so I can give you the scoop on how it works! This week is Nutrition Awareness Week which is part of March being National Nutrition Month. Who knew? Last week I told you about a few over the counter drugs that are known to affect your hearing. Did you know that there are foods that can affect your hearing too? According to Audicus, high levels of omega 3 fats and Vitamin D generally found in fish, such as salmon, tuna, trout or sardines, can have highly positive effects on hearing loss. A regular intake of antioxidants, especially in the form of folic acid commonly found in spinach, asparagus, beans, broccoli, eggs, liver or nuts, can reduce the risk of hearing loss by up to 20%. Magnesium, commonly found in bananas, potatoes, artichokes or broccoli, has been shown to provide additional protection against noise induced hearing loss. You can increase your inner ear’s resistance to the boon of age related hearing loss by keeping a healthy dose of Zinc which can be found in dark chocolate or oysters. Similar to antioxidants, Vitamin C/E act as hearing loss supplements that keep free radicals in check and strengthen your overall immune system, thus reducing the risk of ear infections. The source is easy to find: vegetables (e.g. oranges) and fruits (e.g. bell peppers). According to Hearingwellnessctr.com, studies confirm that hearing loss and poor nutrition go hand and hand. An Australian study reported on in the Journal of Nutrition, has shown that diets high in sugar and carbohydrates detrimentally impacts hearing. A similar study showed that diets high in cholesterol also contribute to hearing loss normally associated with aging. Cutting out sugary and cholesterol rich foods would be a good start to a hearing fitness plan, but good hearing nutrition doesn’t only take into account what a diet includes, but also what is lacking. And according to tinnitisjournal.com, gluten sensitivity may contribute to the pathogenesis of tinnitus, though further research is needed to determine the exact role of gluten in this condition. What does all this mean? There’s a delicate balance of fluids in your inner ear which, like the rest of your organs, can be affected by what you eat. In general, better nutrition is good for your body… which includes your ears! 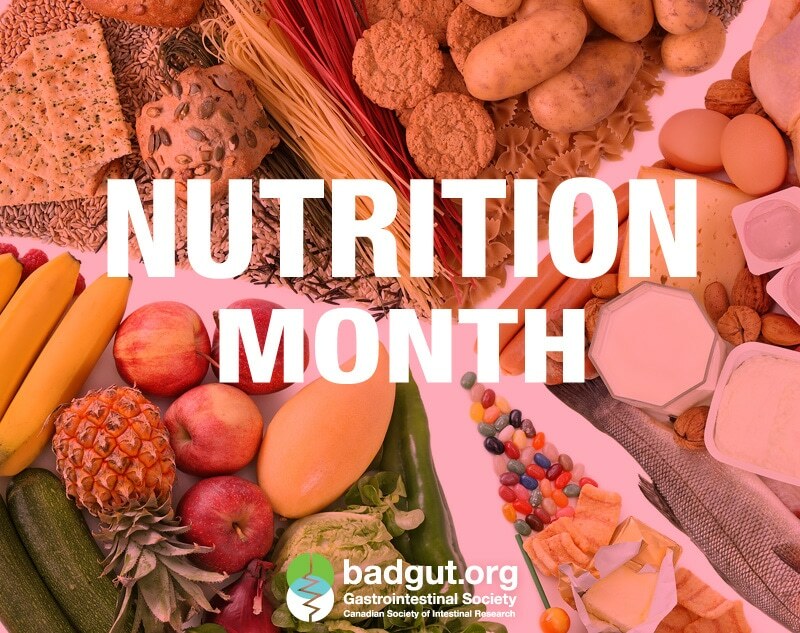 Nutrition Month Image borrowed from the Gastrointestinal Society.